SeaBotix is a pioneer in the development and manufacture of observation class MiniROVs providing a wide range of capable compact ROVs. 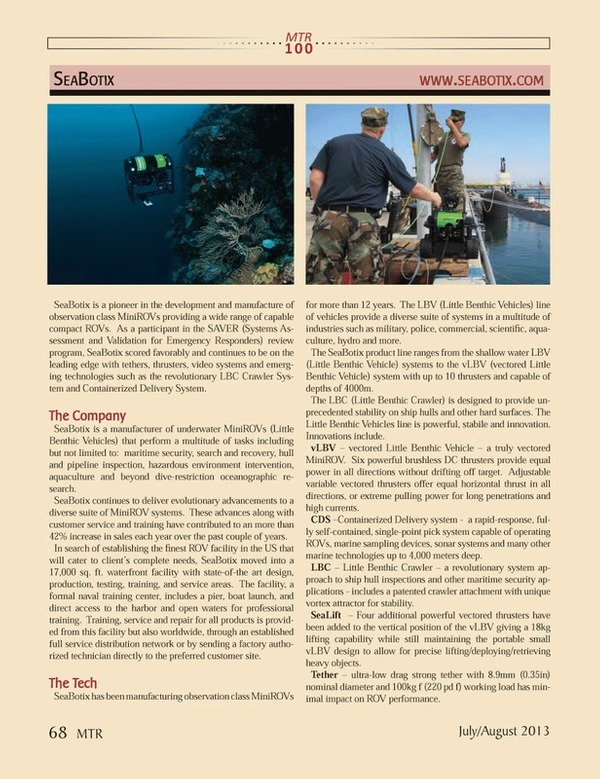 As a participant in the SAVER (Systems Assessment and Validation for Emergency Responders) review program, SeaBotix scored favorably and continues to be on the leading edge with tethers, thrusters, video systems and emerging technologies such as the revolutionary LBC Crawler System and Containerized Delivery System. SeaBotix is a manufacturer of underwater MiniROVs (Little Benthic Vehicles) that perform a multitude of tasks including but not limited to: maritime security, search and recovery, hull and pipeline inspection, hazardous environment intervention, aquaculture and beyond dive-restriction oceanographic research. SeaBotix continues to deliver evolutionary advancements to a diverse suite of MiniROV systems. These advances along with customer service and training have contributed to an more than 42% increase in sales each year over the past couple of years. In search of establishing the finest ROV facility in the US that will cater to client’s complete needs, SeaBotix moved into a 17,000 sq. ft. waterfront facility with state-of-the art design, production, testing, training, and service areas. The facility, a formal naval training center, includes a pier, boat launch, and direct access to the harbor and open waters for professional training. Training, service and repair for all products is provided from this facility but also worldwide, through an established full service distribution network or by sending a factory authorized technician directly to the preferred customer site. SeaBotix has been manufacturing observation class MiniROVs for more than 12 years. The LBV (Little Benthic Vehicles) line of vehicles provide a diverse suite of systems in a multitude of industries such as military, police, commercial, scientific, aquaculture, hydro and more. The SeaBotix product line ranges from the shallow water LBV (Little Benthic Vehicle) systems to the vLBV (vectored Little Benthic Vehicle) system with up to 10 thrusters and capable of depths of 4000m. The LBC (Little Benthic Crawler) is designed to provide unprecedented stability on ship hulls and other hard surfaces. The Little Benthic Vehicles line is powerful, stabile and innovation. Innovations include. vLBV – vectored Little Benthic Vehicle – a truly vectored MiniROV. Six powerful brushless DC thrusters provide equal power in all directions without drifting off target. Adjustable variable vectored thrusters offer equal horizontal thrust in all directions, or extreme pulling power for long penetrations and high currents. CDS –Containerized Delivery system - a rapid-response, fully self-contained, single-point pick system capable of operating ROVs, marine sampling devices, sonar systems and many other marine technologies up to 4,000 meters deep. LBC – Little Benthic Crawler – a revolutionary system approach to ship hull inspections and other maritime security applications - includes a patented crawler attachment with unique vortex attractor for stability. SeaLift – Four additional powerful vectored thrusters have been added to the vertical position of the vLBV giving a 18kg lifting capability while still maintaining the portable small vLBV design to allow for precise lifting/deploying/retrieving heavy objects. Tether – ultra-low drag strong tether with 8.9mm (0.35in) nominal diameter and 100kg f (220 pd f) working load has minimal impact on ROV performance.